Shorty’s is a home-grown, family-owned and -operated pizza place near Baylor Campus in Waco, TX. With one of the biggest covered patios in town, a high-quality unfussy menu, and servers who remember your name, it’s a local favorite. We’re happy to be a popular haunt for college students, families, and Waco visitors looking for an authentic experience in the town we call home. We specialize in New York-style pizza—you can order by-the-slice, or get your own whole 14” or 18” pie to share. Shorty’s is committed to using only fresh ingredients, including hand-tossed dough made from scratch daily, Shorty’s housemade marinara, and a whole milk mozzarella blend, shredded right in the shop. All our toppings are prepared in-house each and every day, from our fresh-cut crispy vegetables to our special recipe hamburger and sausage toppings, with no fillers, preservatives or “extras” the other guys throw in. Enjoy a fluffy Pizza Pillow® stuffed with toppings and cheese and dipped in ranch or marinara, try juicy wings smothered in housemade sauce, add on a side of cheesy garlic bread, or try Shorty’s favorite—fried pickles and mushrooms made to order and never frozen. Shorty’s is proud to serve locally brewed craft beers, in the can or on draught by the pint or half pitcher. Grab a cold one, or enjoy our own homemade sangria or a frozen margarita. We hope to see you soon in our eclectic little shop, where everyone is welcome. Check out our menu, place an order online, or contact us here for catering. In 2010, Ted and his wife Randle started work on the Shorty’s you know today—welding tables, testing recipes, building fences, and everything in between. Inspired by his favorite dive bars on Maui and the sprawling patios in his hometown of Austin, Ted wanted Shorty’s to be the perfect place to kick back with a beer and a slice. 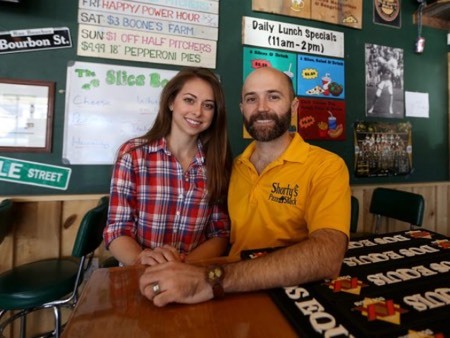 On February 1, 2011, Ted “Shorty” Browning officially opened Shorty’s Pizza Shack. Shorty, an Austin native, graduated from Baylor in 2001 and, to his mother’s dismay, got on a boat to Maui. While living the island life, he worked in restaurants and dreamed of opening a college hangout near his alma mater. By 2015, Ted and Randle needed some help supporting hungry patrons. Shorty’s childhood friends and fellow Baylor alums Kyle and Jaime Ferguson joined the team. Come by and say hey!